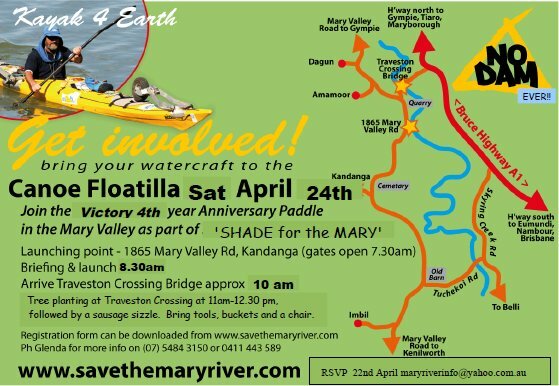 As we celebrate our 4th anniversary of the announcement to dam the Mary River at Traveston Crossing, we have been successful in overturning that proposal. However we still have “Traveston Crossing Dam” in State legislation and the Queensland Water Commission still planning to access a “strategic reserve” in the Mary River which is not scientifically based under the current Mary Basin Water Resource Plan. Also there is still no requirement in the Water Resource plan for fresh water flows to the sea past the Mary River Barrage to protect the Great Sandy Strait. Therefore it is important that we continue to campaign for the flawed Mary Basin Water Resource Plan to be redone.